By all means, stare at your food. Mashable’s Colin Gorenstein reports on a peculiar exhibit that may or may not be delicious. The reason being is the food is not meant to be eaten, just admired. Now I am more of a “savor your food by throwing it into your gaping maw” kind of guy, but to each his own. Here are some images of the exhibit via Twitter for those who couldn’t make it out before Saturday. You can find out more at the Fries of New York website, which even has a fancy map to illustrate the wide area scoured to provide the treats. The exhibit is all thanks to Sir Kensington founders Mark Ramadan and Scott Norton, who have an appreciation for all things fries and condiments. 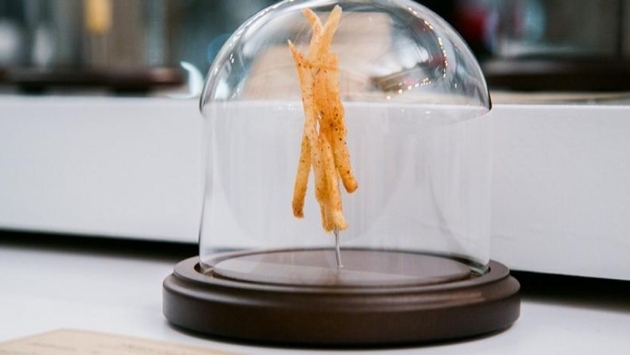 So you still can’t play with your food, but you can certainly admire it as it sits in a glass case. Although no glass case can ever stand between me and my dinner.